We are manufacturing and supplying a number of standard Surgical Instruments and tools to the domestic as well as overseas clients. These instruments are can perform specific actions while carrying our surgery or operation. Our surgical tools are designed for both general and specific use in operation. We are serving these instruments to many hospitals, doctors, surgeons, dentists and beauty clinics across the world. One can buy our Deaver Retractor and Babcock Tissue Forcep at a very affordable price. Our company has excellent talent pool to design and manufacture a range of quality Babcock Tissue Forceps that are handheld and hinged instrument to be used for medical purposes. This tool is very comfortable to use exclusively within the medical operation. Some of the usual instruments in this category include tweezers, pliers, clamps or clips and tongs. We use high-grade carbon steel that can withstand repeated sterilisation in high-temperature autoclaves. People looking for Babcock Tissue Forceps can find it here at a very reasonable price. We are manufacturing Deaver Retractor surgical instrument for surgeons to sophistically perform surgical incision or wound. These medical retractors can hold back underlying organs and tissues, so that body parts under the incision can be accessed. 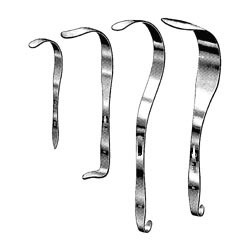 Our surgical instruments possess a curved, hooked or angled blade fitted with a comfortable handle. We are offering such hand-cranked devices with which surgeons can drive tissues apart to obtain the exposure. Here, you can find a range of Deaver Retractors at a very affordable cost.